There are countless ways to record an acoustic guitar, infinite tonal qualities to obsess over, and a staggering amount of gear options to research, choose, and use. But not everybody’s technically inclined or enjoys scrutinizing the differences between tube circuits and field-effect transistors in expensive microphones. The fact is, great music can be made even with the simplest of means. So if you’re someone who just wants to play rather than get hung up on the technical stuff, you’ve come to the right place. This article will detail the absolute simplest method for recording acoustic guitar, the gear you’ll need and how to set it up, as well as the next steps for when you’re ready to upgrade for better sounds. For those looking to get up-and-running as quickly as possible, nothing beats the plug-and-play ease of use offered by a USB microphone. Whereas a traditional recording setup involves separately purchasing and setting up a microphone, preamp, and audio interface, a USB mic incorporates all three into one package. And despite the low price point and associated stigmas, you may be surprised by the audio quality available. Interested in learning the easiest way to record more instruments? Check out the other tutorials we have in this series: electric guitars, bass guitars, and synthesizers. USB microphone (threaded, for use with a mic stand) and cable. Microphone stand with boom arm. Headphones or earbuds with accurate sound and good isolation. Recording software (also known as a DAW, or Digital Audio Workstation). Warning: Not just any USB mic will do. Many of the smaller and cheaper models are meant for desktop use only—permanently attached to their bases, making them difficult or impossible to position in front of your guitar. Be sure to get a mic with threading or a shock mount for use with a regular mic stand (even if it also comes with a base, like the Blue Yeti). This will give you precise control over mic placement when it’s time to record. While most modern USB microphones have fairly good sound quality, make sure you double-check the specifications and features before you buy. Try to find one with a sample rate of at least 44.1 kHz and bit depth of 24 bits. Higher is better, but these values are the minimum standard for quality digital audio. Also check for features such as high-pass filters, pads, and multiple polar patterns. These will make your mic more versatile for recording different sources. One last critical feature to look for in a USB mic is a built-in headphone output. If you just use your computer’s headphone output to monitor while recording, you’ll hear a slight delay on your playing that can become extremely distracting. This is caused by the latency introduced as the signal is converted from analog to digital and back to analog. Microphones with onboard headphone outputs, however, allow you to monitor the signal straight from the microphone without latency. First, install the most recent drivers for your microphone. This may happen automatically when you plug the mic in, or you may need to manually install them from an included CD or download them from the manufacturer’s website. Also check that you’re running the most recent versions of your operating system and recording software (also known as a DAW, or Digital Audio Workstation). In the audio preferences of your DAW, select the audio driver you just installed (instead of Direct Sound, CoreAudio, or whatever the default was). Next, select your USB mic as the input device and its built-in headphone output as the output. Then create a new track and double-check that the input and output correspond to your microphone (this should be the default if you configured it correctly). Arm the track and record a short test to make sure everything’s working properly. Once you have everything set up on the technical end, position the microphone to get a good sound. Start with the microphone about six inches from the 12th fret for a relatively natural tone, or place it by your picking hand for more attack or behind the bridge for a resonant, “woody” tone. Avoid mic’ing the soundhole itself—it pushes out a lot of air, resulting in a muddy sound. The last step before recording is to make sure you can hear everything well. First, adjust your mic gain for a strong level without clipping. If you’re playing along to a backing track or metronome, make sure it’s routed to the headphones. Disable monitoring in your DAW and instead adjust the mic’s direct monitoring level to hear yourself properly. Finally, turn the overall headphone output up loud enough to hear the details but not so loud that it bleeds into the mic. If recording in a good-sounding room, increase the distance from the guitar for more ambience (or use the omnidirectional setting if your mic has one). For a drier, more isolated sound, record in a room with lots of soft materials like couches, rugs, or wall hangings. If you’re a heavy breather or need to sing along quietly, angle the mic slightly down to isolate it from yourself. If you’re a compulsive foot-tapper, put a rug or blanket under your feet. When you’re ready to dive a little deeper into recording, upgrading to a standalone audio interface with professional XLR microphones is a simple upgrade that can unlock a world of sonic possibilities. While USB mics offer convenience by combining the microphone, preamp, and converter in one unit, standalone interfaces give you the freedom to use any components you like—and upgrade them in the future. Most audio interfaces on the smaller end feature two separate inputs, which should be all you need for recording acoustic guitar. With two inputs, you can blend the sound of two microphones, record a mic and an acoustic pickup, use stereo techniques, or record your guitar and vocal at the same time. Most interfaces also feature built-in preamps of decent quality, but you can purchase external preamps for different “flavors” of tone. Large diaphragm condensers like the Audio-Technica AT 4050 offer a clear, natural sound. Most USB mics are this type. Small-diaphragm condensers like the Shure SM81-LC capture a bit more detail and respond faster to transient sounds. This is many engineers’ go-to type of mic for acoustic guitar. Dynamic microphones like the Shure SM57 are not as good at capturing detail, but can give an aggressive, midrange-focused sound to hard strumming parts. Stereo microphones like the RODE NT4 take the guesswork out of stereo techniques, making it easy to get a wide, full sound or record guitar and vocals with maximum separation. 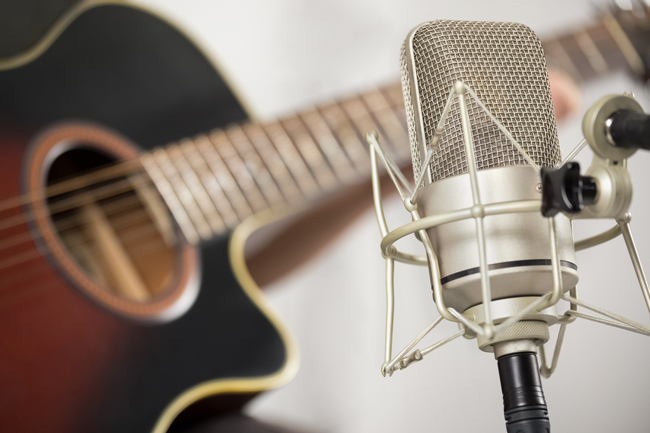 Want to learn how to record more than just your acoustic guitar? Check out our guides on the Easiest Way to Record Your Synthesizer and the Easiest Way to Record Your Electric Guitar. For more tips about home recording, see our Home Recording Basics series.